Have you been investing in mutual funds your whole investing career but recently you were thinking what it would look like if you start investing into individual stocks? Maybe your very first thought was diversification. Your account is still small and you won’t be able to buy more than 5 stocks at this point and that makes you uncomfortable. You know that experts recommend at least 30 stocks in your portfolio to reach a decent amount of diversification. But how can you buy 30 individual stocks when you just started saving and investing and all you can save is $100 monthly? What if you would have an opportunity to build your very own mutual fund of stocks you want to own? Well, today you have that opportunity and it is very simple. And you do not need millions to do it. You can start your own mutual fund with just 250 dollars (it’s like buying your first position in a mutual fund, right?). Yes you can build your own mutual fund and it will not cost you anything and you do not need millions or billions to start your own mutual fund. I found this opportunity thanks to my friend and fellow investor Wayne Bow who sent me the link to a great service which would allow it. A broker which allows you creating your own mutual fund is Motif Investing. And how does their service work? Once you open an account, which is for free, you can create your own mutual fund, which is called a Motif. You can add 30 of your favorite stocks into the motif (portfolio) and you can create as many motifs as you wish. And more on that, the broker will give you a bonus up to $150 to trade with. Want to make 150 dollars right after opening an account? If you open an account, Motif Investing provides you with up to $150 bonus. If you deposit for eaxmple 1250 dollars and make 5 trades, you will have 12% profit right there! Get up to $150 when you start trading at Motif Investing. Learn more. I already did it myself and will be reporting my progress soon. 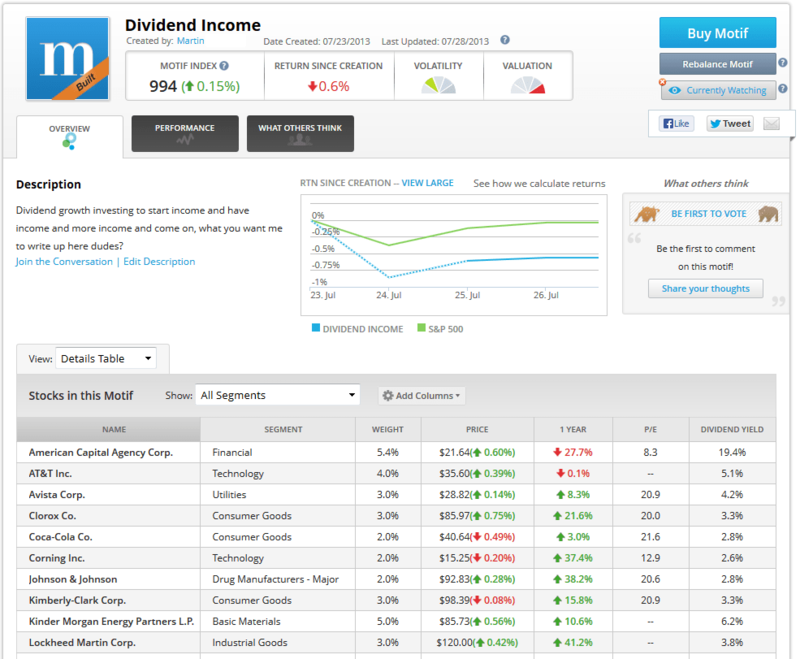 I created my own dividend growth stocks motif. 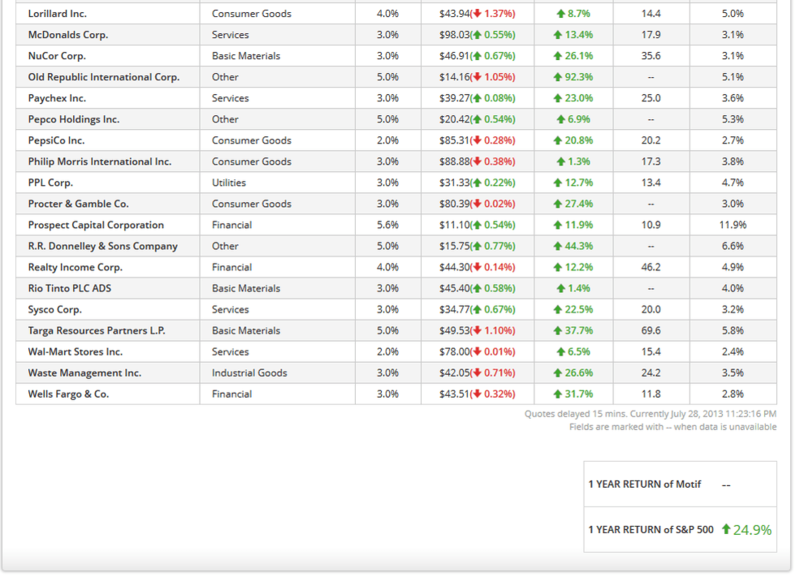 I added stocks I want to invest in, but my current taxable or ROTH accounts do not allow me buying them all. With Motif investing I could create my own motiff of all stocks I like and I will be able to buy them all. Once you created your own motif (your own mutual fund) and funded your account, you can start buying your motif. The minimum investment to buy a motif is $250. For each motif purchase or sell you will pay $9.95 commission, which is in line with other brokers. If you want to be purchasing individual stocks (outside of the motif) then the fee is $4.95 per the stock or ETF. When you buy a motif, you will be buying fractions of all stock inside your motif, the exact same way as you are purchasing your mutual funds in your 401k. For me this is an excellent idea how to stay diversified even with small money. You can be buying not only your own motif, but you can also buy motifs of other investors. You can create as many motifs as you wish and be buying them all. So although one motif is limited to 30 stocks, you can create two motifs or three motifs and be buying 30, 60, or 90 stocks and their fractions as long as you reach your dividend investing goal. And of course you can set your own desired allocation in each industry or individual stocks within the motif and you can always change that allocation to reflect your market anticipation. Isn’t that a cool idea? The broker allows you opening all sorts of accounts such as individual, joint taxable, IRA, ROTH IRA, Rollover IRA, etc. I think this is a great idea how to invest your retirement money in stocks you want the same way as if you invested in a mutual fund. I liked this idea a lot, so I opened an account with Motif Investing and I will invest with them. I will report on this blog how that investing worked. What do you think, is it a good investing idea? Seems to me when you buy (or sell) you are at the market so it pays to use very high liquid stocks and that volume is consistent, especially at 2pm when they say the market order execution takes place. If the volume is not high at that time you could see slippage between bid/ask and get scalped bad if the share amount purchased (or sold) is significant. You can tell there is definitely passion and interest in providing something that is an alternative to the usual dry and boring investments. I think this is to get more young people involved in their money, actually caring about it. Of course, the price is daunting and many more affordable alternatives exist like commission-free ETFs. I just stumbled across this article after searching for some mutual fund tips online. I agree with you Martin, creating your own lets you invest your way, while still diversifying your risk at the same time. I take some moonshots from time to time, and overall I have generated some pretty steady returns. Great post! I hadn’t heard of that broker that allows you to do this, but I will certainly take a look. Cool idea. Never heard of this before. Great way to get diversified in a simple system. Nice low minimum investments too which helps those just starting out. Nice find, Martin. Ben, thanks. Yes i like it. I also like that you can buy all 30 stocks at the same time, so you will be diversified from the very beginning. This is definitely an interesting idea. I think it’s a great option for someone who doesn’t have a lot of initial money to invest (like myself). I’ll have to check it out because I like the premise. I fell in love with this idea. I like that you can create a portfolio of 30 stocks and be buying it slowly step by step, all of them at the same time and later use rebalancing tool. the exact same way as with 401k. That is a great concept to me. I actually like the idea, they are on to something. The $10 commission is kind of high, but could be reasonable depending on the size of purchases. I couldn’t find any information about expense ratios (like a mutual fund has). Perhaps they don’t charge one? In effect you’re giving up control of purchase price, but can just pick the highest quality companies that tend to perform well long term. Not a bad way to go about it! I am actually pretty interested in this and would like to follow along. Someday I may join you in this, but I need to investigate further. CI, Do you consider $9.95 fee expensive for an opportunity to buy 30 stocks? Try to buy 30 stocks elsewhere and let me know how you have paid. I was referring to buying the minimum of $250 (lowest allowed). Yes it is too much to pay no matter if it 1 stock, 30 stocks, or 1,000 stocks. 4% down the drain right off the bat. Personally I would wait to the $1,000 threshold or something like that depending on your unique circumstances. Anyways many brokerages offer commissions less than 10 bucks, but don’t allow you to assemble your on mutual fund in one package like this. The $10 commission is not selling point here (although they might try to spin it that way). I have been assembling my own mutual fund one stock at a time. Motif simplifies it, but you lose some control. CI, I somewhat agree with you. It depends on an amount you put in and with any other broker where the fee is around 7 – 10 range you want to invest at least 1000 or more otherwise the fees will eat you up. I do not understand however, where do you lose control with Motif? You can always set allocation or even exclude the individual stock from the motif and sell it if it no longer meets your criteria. You can even buy more shares out of the motif. The motif itself doesn’t limit you in doing so. The stocks in your portfolio are still treated as individual stocks, so you can either buy them individually or as a motif all 30 at a time. As far as commissions, I haven’t seen too many brokers providing services I like and charging less than $10, thus I still think, Motif is in line with others. Yes you can have brokers which provide with commission in 4 dollar range, or I think Interactive Broker can get you even lower, but there are caveats in there. With IB you need at least 10k initial deposit to open an account and maintain a certain amount of trades monthly and Sharebuilder or Optionhouse can provide you $4 fee too but again with limitation of certain amount of trades, or similar. They do not charge anything besides the commission, so no expense ratio at all. All you pay, is the commission and then nothing. You will actually own whole numbers and/or fractions of those stocks like with a regular broker. I like the idea a lot so I must give it a try!